First night of the SF Tape Music Festival tonight. My colleague Thom Blum premiered a fantastically beautiful and nuanced piece, a state of grace. Aaron Ximm, recent father and former director of my favorite concert series in San Francisco, presented a painfully lovely modification of recordings made of Southeast Asian orchestras. 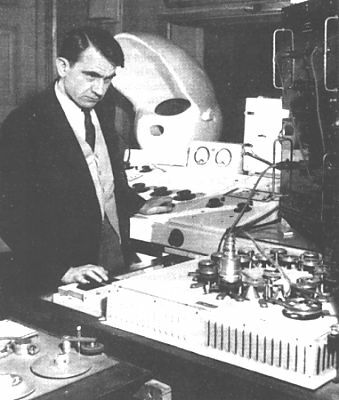 Overall, a lovely mix of modern fixed media works and some of the more famous works from the early days of electronic music, many from the first concert of musique concrète - the Concert du Bruits of 1958, my birthyear (and here today is my birthday). Sadly all of the old guard seem to have died in recent years: Pierre Schaeffer, György Ligeti, Vladimir Ussachevsky, but it was surprising to me how similar the old and new pieces were. The rhythms and the range of the sonic variations were quite alike, more amazing given the painstaking methods available in those heady early days: the razors and the tape and the wires and the bouncing and the fiddling with the oscillators, compared with the whiz-bang point and click technologies available to the sound-composer of today. But what struck me the most was that the aforementioned rhythms, like the rhythms of the classical-to-modern instrumental music that preceded, fell into the range of speech rhythms, nothing happening too slowly or too quickly developing, all of medium tempi. It reminded me of a discussion in Gérard Grisey's composition seminar. It had been noticed that the tempo dimension had been woefully unexplored. But why was it that the European modern music of that time - the mid-80s - was pushing only towards a slower tempo? The harmonic rhythm of his music, like all the spectralists, was by its nature very slow, examining the intra-harmony of all the pitches of a single tone under a time-microscope. Why was no modern music fast? I answered immediately: because that would require a pulse, and pulses had been rejected by the modern musical establishment at the time. It took the music of the minimalists and maximalists and totalists to go back to fast. When I was writing Little Girl and using bits of pieces of the minimalist language, I noticed the fact - and I wasn't the first, ok? - that passages of eighths could seem much faster than passages of sixteenths, and that the pulse depended on the perceptual rhythmic groupings or perceptual chunks of time. How we perceive these chunks are under the control of any good composer, but these issues stand out very quickly in patterned music, e.g., the Alberti-like arpeggios that attract so many of us. The problem with fast say, totally serialized music, is that without pattern or regular repeated rhythms, even as the notes whiz by ever faster, the brain keeps chunking bigger groups of them to bring the perceived tempo down into familiar territory. It has to be led by the hand into very fast tempi by the use of lots of patterned cues. House music does it, easily hitting 180 bpm, the distinction of genre sometimes falling almost exclusively to the tempo range, but within the limitations of extreme repetition and audiences under the influence of very particular drugs. And, what is even more interesting about this speeded-up dance music is the concomitantly slow or even nonexistent harmonic rhythm. 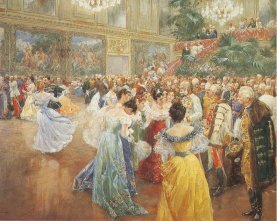 When writing my orchestral waltzes mentioned in recent posts, I realized that the harmonic rhythm of the famous old 19th century waltzes, e.g. those of the junior Strauss, was much slower than what I typically succumbed to in a waltz feel. Satie-influenced, I've tended to believe in the doctrine of one chord per measure, but that's clearly not the way the Kaiser liked it. But still, the Kaiser and I favor a harmonic rhythm that is within the normal range, that doesn't raise too many skirts up to allow us to see the brutish realities of nature beneath. I remember a composer friend being scolded back in college for too fast of a harmonic rhythm. That struck me strange back then and it still seems odd now. It's easy to make your harmonic rhythm slow - lots of music does that - but it's actually pretty hard to make it fast, and too fast? Well try it - it's not easy. At some point, the brain re-chunks the music to bring it back into the normal range. And, in the tape concert, you could hear an analogous timbral rhythm in all the pieces, old and new, again often falling into the same range. One technology not so easily available to the old school concrète folks was the multi-speaker spatial diffusion on display, the performance aspect of the fixed media world that also gives us as the audience, sitting in the almost-dark, at least something to watch. The diffusion tended to coerce the primeval recordings into the same sonic world as those more recent. Sometimes, most noticeably for me in the Ussachevsky, it was a bit garish, pushing that piece in particular into a faster spatial rhythm that gave the whole thing a jazzed-up feel. But again, the spatial rhythms never seemed too fast. Even when there was a quick ping-pong-like panning, it was perceived as a gestalt, as a sound with a complex spatial quality, not leading us to tap our toes, not pulling us towards speed and all its dangers. There are several circumstances that help fuel my Nazi-interest addiction: (1) the fulsome record-keeping, film-making, accounting and cataloguing of the Dritte-Reichists themselves (2) the dumping into the public domain of the above by the Allied conquerors (3) the hundreds of thousands of post WWII memoirs by and interviews with and trials of combatants and non-combatants. So we do really know what happened, OK? And yes, they, the National Socialists really did kill a whole heck of a lot of people, Jews and Romanis and Slavs and Gays and Jehovah's Witnesses and the Infirm and Intellectual and Freethinking, and they really did run the exhaust into the back of the transport trucks and they really did slaughter them wholesale in gas chambers and they did machine gun them while standing in their self-dug graves and they did work them to death to build weapons and vengeance weapons and did inject them with diseases and decompressed and pickled and chopped up and tortured and starved and killed in every way imaginable. And such behavior naturally upsets those who remember or are related to those who remember. And thus, the denial of the same is a reasonable symptom of a certain type of mental illness, a lack of willingness to accept reality, the real reality that is, i.e., our consensus hallucination of the way things actually are. 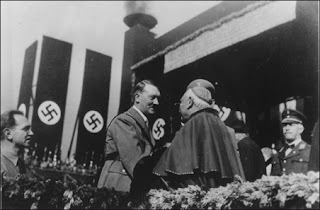 I personally think that one needs to suffer from this particular illness to accept the Catholic Church's teachings and behaviors through the centuries, from the Assumption of Mary to the Cadaver synod, so maybe it isn't hard to understand that a Catholic bishop might believe that "the historical evidence" was hugely against the Holocaust, but still, for a Church and a Pope that suffer from too close a connection to the above, one would think they would be sensitive to the unbelievable awfulness of the whole situation, bending over backward to salve and soothe the wounds so recent and so deep. But no, today we see that Benedict XVI doesn't get it, reinstating Richard Williamson and other right-wing bishops. The story in the NY Times here. Yes, these are "declarations that we don't share in any way," well, except that we have brought these declarations back into the Church. Gott im Himmel. UPDATE: Richard Williamson's un-excommunication has now been made contingent on his recanting of his no-gas-chamber belief. zmjezhd sent me a link to the bishop's blog where I'm sure we will all be able to follow his crisis of faith. I don't recognize this program. I do. He's wearing a Nazi uniform. We're on Earth, during the Second World War. Totalitarian fanatics bent on world conquest. The Borg of their day ... no offense. All this being only one of many Nazi references throughout the various incarnations. 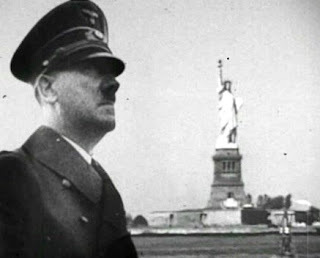 The picture above being from the visit of Adolf in an alternate 1944 (one many alternate WWIIs where the Nazis prevail) to the occupied US of A, this from ENT, Storm Front Part II (again, to those in the know). But, in both cases, 7 of 9 and the NS, the uniform is the thing. Flash: Miss Erika, one of our remote correspondents, has sent along this communiqué. Are you aware of the nazi sweetheart march "Erika" ,1939, by composer Herms Neil (was the marching song of the Waffen SS)? I feel it needs a place in your blog as it has such a forceful & catchy refrain. Are you still thinking of your little bride? Name "Erika" had been derived from the heather plant (German: Heide, Erika; Latin: Erica). Vast heather-yards are one of the proud symbols of German natural heritage. The small room of the third verse no doubt a prescient image of the small room his corpse will inhabit soon. It is in fact a fine example of the excessively sentimental and jingoistic Soldier Marching Song, like so many others, e.g., Just Before the Battle Mother ("Farewell, mother, you may never / Press me to your heart again"), with a tune that, although needing to be carried along with the heavy rucksack, lightens the load, and reminds the bit of cannon fodder why they are fighting and dying, romanticizing the blown apart bits of body and blood mixing with the bittersweet tears of the girl and/or mother left behind. Once heard, these tunes are hard to forget, and I have found myself since Erika Deer's dispatch humming the chorus as I have gone about my day-to-day. And I find myself hoping that, in the new coed & don't-don't-ask-don't-tell army of the US of A, there will be both gender-neutral and gender-preference-neutral marching songs as stirring as this, sung by legions of men and women and all points in between, marching to their deaths filled with a heady and passionate joy.